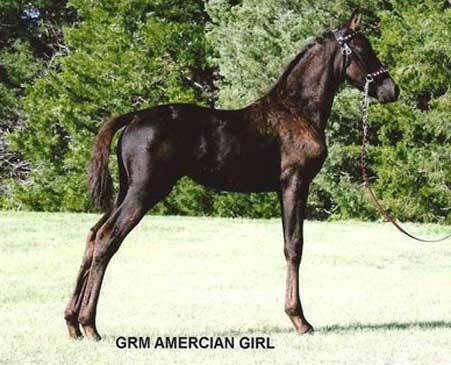 This homozygous all black filly is living proof of the quality and depth of the GRM breeding program. It is fun to see on the pedigrees horses that you have raised from the front to the back row and beyond. 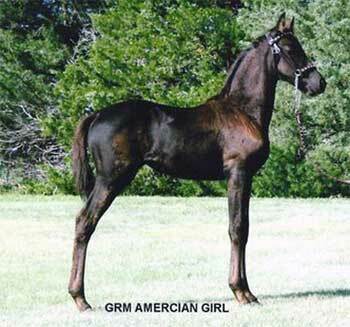 American Girl is very stylish, feminine, beautiful headed, and has loads of trot. Complete with a dynamic personality, she will excel as a broodmare or a true friend and competitor. This filly was imprinted at birth, haltered at a few days of age, been bathed and is current on all shots and worming.